I've noticed a few people asking about this axe recently on the green woodworking forums, so I thought it was about time I wrote a little review. I should probably start with a bit of background on the axe. If you don't already know about Robin Wood, then you should. He is one of the leading figures in green woodworking and traditional crafts in the UK. Primarily he is a bowl turner, but he has also been influential in the popularisation of spoon carving. For three years he has been the co-organiser of Spoonfest. When running spoon carving courses he lamented the fact that he couldn't recommend a suitable axe to his students that was the right side of fifty pounds. Probably the cheapest option at the time that would be ready to use off the shelf was the Gransfors Bruks Wildlife hatchet, which currently retails at about £65, a big outlay for someone who is just beginning. This led to him designing and manufacturing his own carving axe. The axes are not made by Robin, the heads are drop forged in China and ground in Sheffield. The handles are made in the UK to Robin's design. As one of the goals was to produce an axe that would be affordable to the beginner, it would be impossible to have the heads hand forged and still keep the cost at an appropriate level. 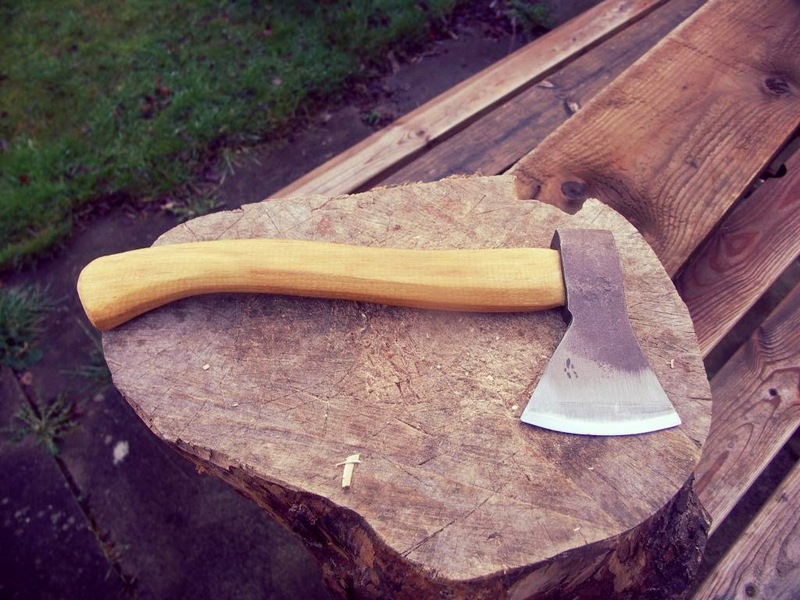 At £35 it is probably the cheapest axe on the market that comes ready to use for carving. At 500g in weight it is perfect for spoon carving, especially for those who aren't used to wielding an axe or don't do it that often. The light weight also means that you can be very precise with it. When I first tested it out I started carving a spoon out of some relatively hard apple. I ended up carving the entire spoon (except the bowl) using just the axe. It's not the prettiest spoon I've ever made, but it does show what you can do with a well tuned axe. The edge comes very sharp with a flat bevel that is polished to a mirror finish. It bites really well and the head can be held in the hand to make planing or knife cuts. The handle is made of Hickory and has a lovely textured finish, similar to that found on the tools made by Svante Djarv, the idea being that it provides extra grip. I've personally never had a problem with a non-textured handle being slippy, but it definitely looks cooler like this. I would certainly recommend this axe to anyone that is beginning spoon carving, but also to anyone that wants a light weight axe. At £35 it is a cheap carving axe, but it doesn't scrimp on any of the features. It is sharp and well balanced. It has a long cutting edge for its size, which extends above the handle. This makes it perfect for slicing cuts. Generally I would always advise people that when buying tools you should get the best that you can afford, but I'm not sure that spending more money would get you anything more. I've never used a Gransfors wildlife hatchet, but I used to own a similar Wetterlings axe. It worked fine, but the edge needed to be completely reprofiled and even then I prefer the pattern of the Robin Wood axe. You can buy axes with similar pattern heads for a lot cheaper, like the Bahco axe, which you can pick up for about a tenner. I've even managed to get a couple from car boot sales, but in order to get a suitable edge on it, you're going to have to spend a fair bit of time reprofiling it. Not ideal if you're new to the hobby. The one drawback to this axe is the fact that its light weight makes it unsuitable for removing a lot of wood. I picked it up last night to try it out on a bowl blank I was preparing. I put it down after half a dozen swings as I just didn't feel that it was up to the task, the bowl was about 9" in diameter. You can buy the axe directly from Robin Wood or from Woodland Craft Supplies. The axe head from the boot sale looks like a Hudson Bay Camp axe, from Council Tools in the US. Nice shape, a bit like a bearded Axe. it's possible, but I'd be surprised. I have two of them and there are no markings on them except for the weight of the head on one of them. I think it's more likely they were made in China. thanks for the link. I have just received the axe from my girls for my 55 birthday,hope it serves me well. Where did you get the sheath from? Hi Nic. The sheath is one that I made. If you're interested in making one I could send you a template. That's would be brilliant, thank you! I recently bought this Axe and have been very impressed with it. I don't think there is a better designed carving Axe out there, regardless of price. The Hickory handle on mine is the tightest, straightest grain I think I've ever seen. It came looking a tad dry so I added five or six applications of Boiled Linseed Oil, which it took hungrily - and looks better afterward. I ordered a mask from Paul Dore on ETSY made just for this Axe. All in all, it's one of my favorite tools. A true gem. I really like the look of this axe after making comparisons and reading reviews regarding some of the more expensive and recognisable brands out there. I was drawn in by the very reasonable price of £39.00 plus shipping at £8.50. We are now up to two thirds the cost of similar axes from Gransfors, Hultafors and Wetterlings but I would still need to spend approximately £20.00 on a mask from elsewhere putting it into the same price bracket as the aforementioned brands that come with a mask. Does anyone know how to obtain this axe? Year of the chair.....game on!